The main advantage of using Hashcash for Contact Form 7 is that attempts by bots to send spam through your contact form will be blocked without inconveniencing human beings that want to contact you. Users won’t be forced to solve weird image captchas just to reach you. Hashcash for Contact Form 7 requires that you have both WP Hashcash and Contact Form 7 installed. 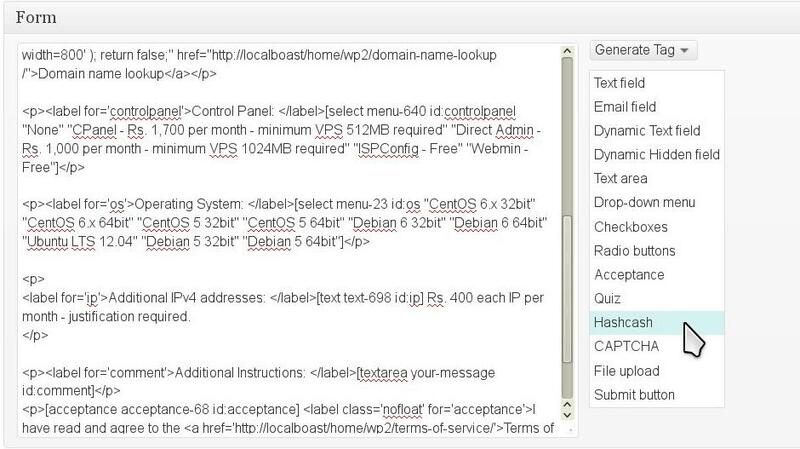 And, of course, you have to download and install Hashcash for Contact Form 7 too. Adding Hashcash spam protection to your contact form is simple. Just edit your contact form and use the generate tag option to add the hashcash tag. Alternatively, you can also manually enter the tag [wphc] in your contact form. Save your contact form and you are good to go! If everything is OK the plugin does not display anything in the contact form. It actually works by adding a hidden input tag to the contact form.